A snap from the Arhaus online catalog offers a glimpse of its rich mix of furniture and accents. If you’re in need of a little mood-brightening inspiration, then look no further than Arhaus. The 25-year-old home furnishings retailer defied the economic odds last year and experienced a double-digit sales increase in the midst of a lackluster economic climate, which says a lot about the spirit-lifting quality of its offerings. It also just opened a big new store in the Meatpacking District of Manhattan today, so if you’re in New York, you can get a firsthand look at the beautiful accents and furniture that make the company so successful. We got a sneak peek at the 28,000 square-foot store yesterday. And when Gary Babcock, the company’s senior VP of design, toured us through the dramatic one-block-wide, two-story space, we could easily see why Arhaus’s appealing mix of feel-good furniture, unique accents, and one-of-a-kind curios and antiques from all over the world are so broadly appealing—together they create an irresistible ambience that’s at once exhilarating and comforting. With an ethos that’s all about workmanship, Arhaus is known for using all natural materials—some of the new offerings in the New York store include Gustavian-inspired tables, chairs and armoires made of scrubbed pine and white-washed woods. It’s also known for its custom capabilities—Arhaus’s upholstered pieces can be made with any of its 2,000 fabrics in six weeks. “We believe that rooms should be decorated not to be looked at but to be lived in,” Gary told me. 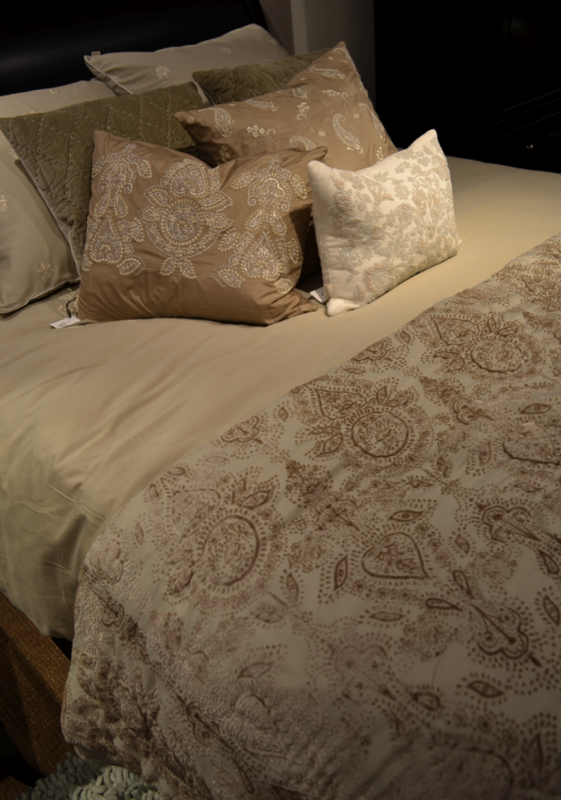 No wonder I felt instantly at home the minute I walked through Arhaus’s door. Brimming with dramatic architectural details, including an industrial steel staircase with brass accents, intricate marble mosaic floors, pressed tin ceilings, and handmade recycled teak fixtures from Indonesia, the New York store, which is located at 410 West 13th Street, is one of 38 stores that have opened over the last two decades across the country. If you can’t find a store near you, you can still get access to its wares on line by going to its Web site. It’s definitely worth a visit. 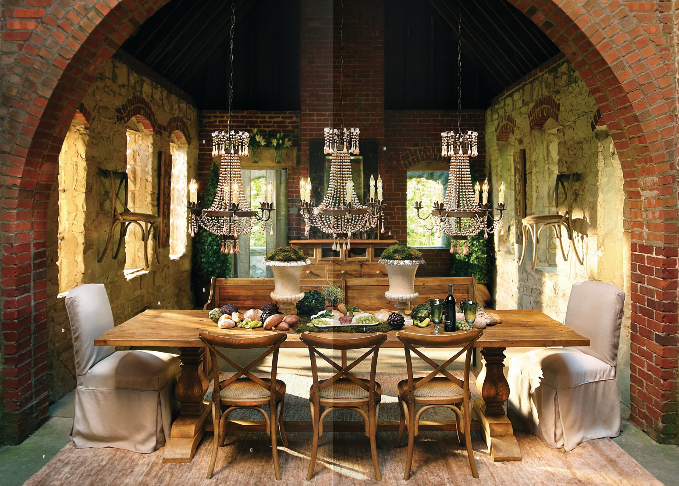 An eclectic dining room featured in Arhaus’s online catalog includes an appealing, unexpected mix of formal and casual pieces. 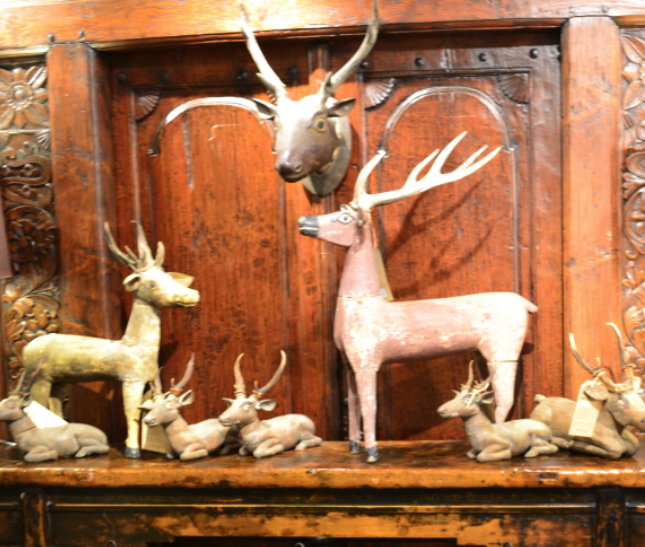 Wooden reindeer from Indonesia against a carved teak backdrop from Southeast Asia add spice to a corner of the new Arhaus store in Manhattan. Pillows with subtle velvet burnout designs are among the many beautiful soft furnishings in the new Arhaus store in Manhattan.